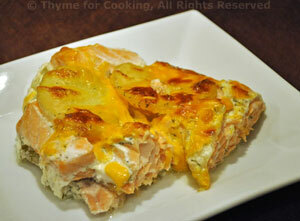 Salmon, Smoked Salmon and Potato Gratin, quick, easy gourmet dinner. The quantities of the salmon, smoked and fresh, are not precise, use whatever comes in a package. A mix of fresh and smoked salmon gives a lot of flavor to this simple gratin. Simmering the potatoes in milk shortens the baking time. The potatoes: Thinly slice potatoes. 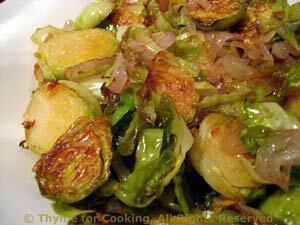 Pour milk into a medium skillet and heat to simmering. Add potatoes, in layers. Cook, uncovered, until potatoes turn translucent, about 15 minutes. The salmon: Cut fresh salmon into 1" (2.5cm) thick slices. To assemble: Remove 1/3 of the potatoes from the milk, arrange in a baking dish. Spread smoked salmon on potatoes. Top with 1/3 potatoes, in a layer. Arrange fresh salmon on potatoes. Top with remaining 1/3 potatoes. Pour over the top of the gratin. Top with shredded cheese, cover with foil and bake, 400F (200C) for 20 minutes. Uncover and bake 10 minutes longer, until cheese starts to brown. Remove and serve.